The same quality and design as the premium solid euro container. Available in sizes ranging from 4.6 litres through to 175 litres. Reinforced side ribs for added strength. Usable from temperatures -20C to +80C. Integral handles for easy carrying. Smooth interior walls for easy cleaning. 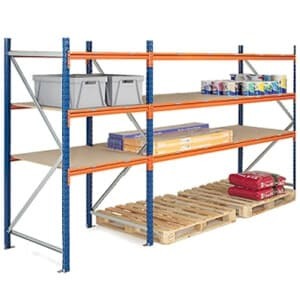 Designed to be stacked securely at high levels. Snap on lids for air tight storage. Food grade plastic suitable for just about any environment. 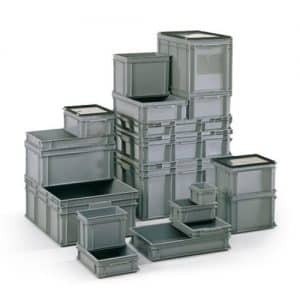 Containers inters tack to form a load with standard outer dimensions. Ventilated sides and base allows for light penetration and airflow between containers. Designed to fit euro pallets. Manufactured from high density polypropylene for a load capacity up to 20kg. Reinforced corner and side ribs for added durability. Integral handles for easy transportation. 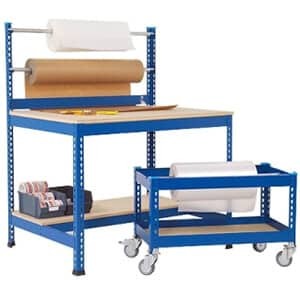 Designed to neatly stack for easy storage and stability during transportation. 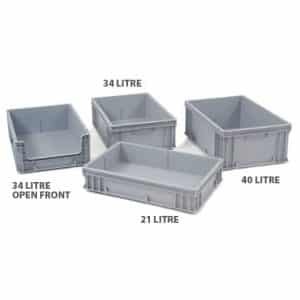 Choose from a range of sizes from 15 to 60 litres. 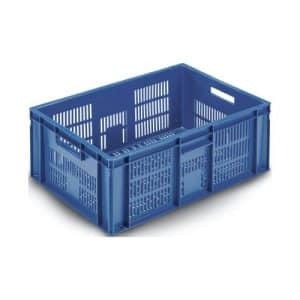 Food grade plastic containers designed for use with standard European pallet sizes. Available in sizes ranging from 2 litres through to 175 litres. 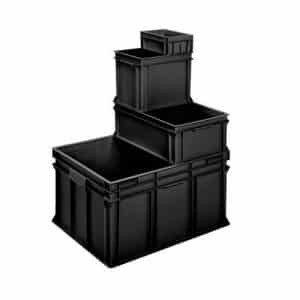 Reinforced base and corner posts ensure maximum strength and durability. Integral handle grips on all four sides for ease of handling. Smooth interior walls mean maximum storage space. Suitable for use in temperatures ranging from -20 to +80C. Lids available as an add on. Ventilated sides and base allows for free movement of air and light between containers. 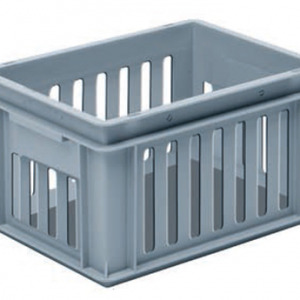 Manufactured from high density polypropylene for a load capacity up to 30kg. Reinforced side ribs for add strength. Can be palletised on 800x1200mm and 1000x1200mm pallets. Made from polypropylene for extra strength. 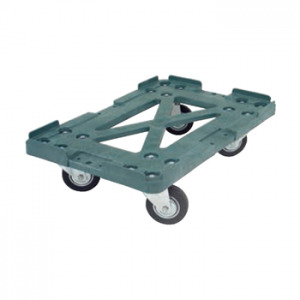 Heavy duty rubber castors for smooth transportation of containers. 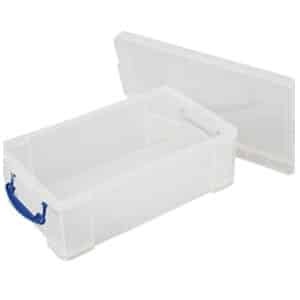 Suitable for 21 ‚34 or 40 litre euro containers. 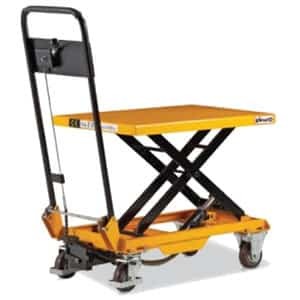 Mobile dolly also available . Designed for use with automated conveyor. 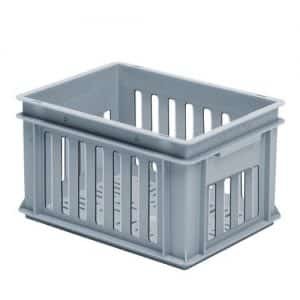 Light grey polypropylene with reinforced base for extra strength. 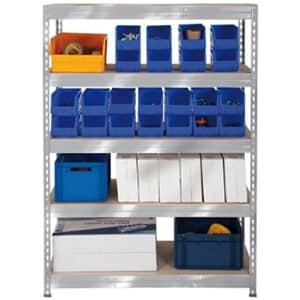 Stackable allowing for easy storage. 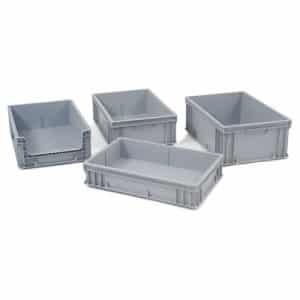 Open fronted containers available for easy picking and storing . Lid and dolly also available. Internal dimensions (H)103mm x (W)355mm x (D)555mm.